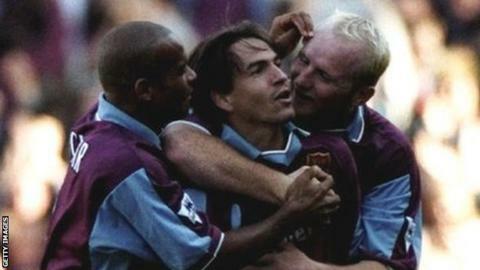 Hartson, right, scored 33 goals in 73 games for West Ham, many of them created by Berkovic, centre. John Hartson has admitted kicking West Ham team-mate Eyal Berkovic in the head in a 1998 training-ground incident is the biggest regret of his career. The former Wales striker, 39, told BBC Radio 5 live's Inside the Dressing Room programme that he was ashamed of the incident. Hartson was fined by West Ham and the Football Association after the assault, which was filmed by a television crew. "I brought a lot of embarrassment on my family, I felt ashamed," he said. Hartson, who played more than 500 games for eight different clubs during a 15-year career, retired in 2007 with more than 200 goals to his name. He was diagnosed with testicular cancer in 2009 and underwent emergency surgery after doctors discovered tumours in his brain and lungs. He is currently in remission. Hartson has also fought a long battle with a gambling addiction. Speaking in depth for the first time about the incident with former Israel international Berkovic, Hartson said he was "constantly reminded" of the incident. "Even today it is the biggest regret of my career," he said. "I was 20 years of age. I was very boisterous, probably a little bit angry. I'd left Arsenal in 1997 and they went on to win the double in 1998. "Eyal Berkovic was a good lad and to this day I don't know why I reacted the way I did. It was nothing personal against Eyal. It could have been anyone of the players on the training ground that day." The incident was caught on video by a camera crew and the clip was shown on TV news programmes and made headlines in the national newspapers. "The aftermath of it was horrendous," Hartson added. "I was front page of every national newspaper across the globe, I was on the News at Ten with Trevor McDonald, there were newspapers knocking my mum and dad's door down in Wales. "I've recovered from that, I've gone on and I've scored goals and I've set up the charity doing good things now, but that always went before me. "It was a massive incident in my life. I'm over it and it happens. I was young." Having signed for West Ham for £3.2m in 1997, Hartson was sold to Wimbledon in January 1999 for £7.5m and went on to score more than 100 goals during five seasons at Celtic. He added that he has since made up with Berkovic.